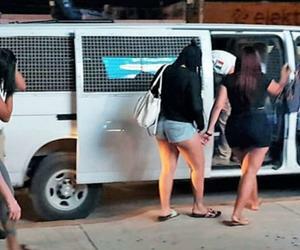 A group of 50 exotic undocumented dancers, in which there are several Cuban, Venezuelan, Brazilian and Salvadoran women, have been transferred from Cancun to Chetumal (Quintana Roo state, Mexico) to be deported to their respective countries. The National Migration Institute of that country declared that the women were captured in different dens in Cancun. The group of women are currently in the immigration office of the Southern Border to be expelled from the country. One of the transferees - whose nationality has not been specified - has a two-year-old child. Local press reports indicate that some of the women requested legal assistance to process "amparos" to leave Mexico by their own means, within a period of 48 hours. To that end, they have sought the support of the United Nations High Commissioner, because they believe that the conditions of the National Institute of Migration violate their individual guarantees. So far the authorities have not specified the number of dancers from each country who were arrested. Cancun is often a frequent destination for Central and South American women to work as dancers and prostitutes.